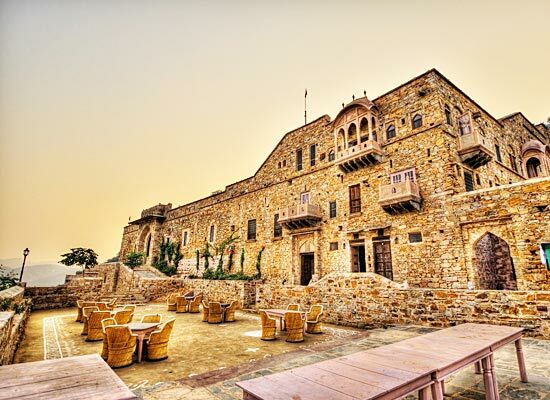 "The famous heritage hotel in Alwar, The Dadhikar Fort is one of the most stunning heritage properties that truly reflect the authentic forms of Indian Culture and Arts. Surrounded by Aravalli hills on all sides and lush green forests nearby, this hotel is a complete paradise for nature lovers. All the basic requirements of tourists are fulfilled with a stay in here. 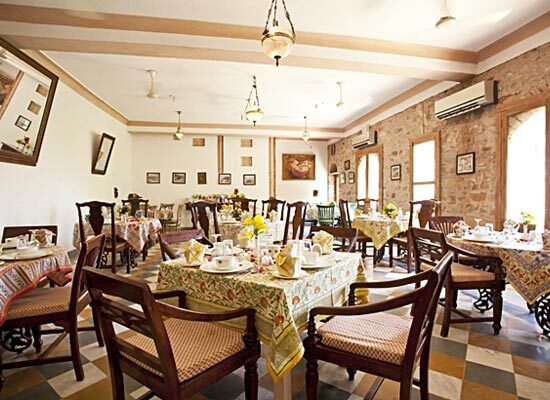 The rooms, the dining hall and even the business center in this hotel are designed according to traditional Rajasthan architecture which just gives this hotel extra charm and attraction. 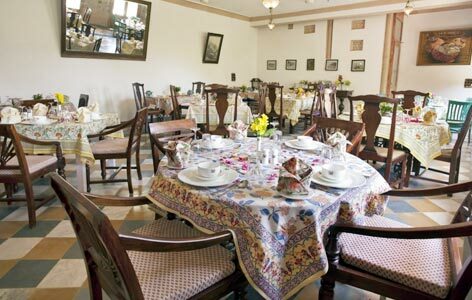 A stay in this hotel makes one's tour to Alwar simply unforgettable. The historical structure Dadhikar Fort was constructed approximately 1100 years ago in the 9-10th century as a residential camp. It was constructed right in the middle of thick forests surrounded by Aravali Hills by the deserted King Chand and his family. He was forced to leave his capital city Abhanagari (now Abhaneri) and live in the forests because everything he owned was lost in the massive floods at the time. It was named as “Derakar” as “Dera stands for camp denotes camp “kar” means to do. So “Derakar” stood for “doing a camp” or making a camp. 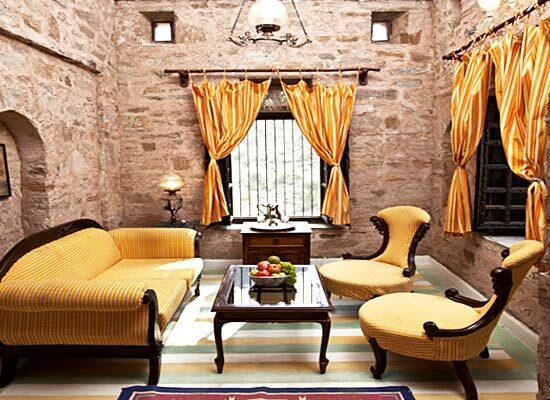 The accommodation facilities in Dadhikar Fort, a popular heritage hotel in Rajasthan, are simply spectacular. 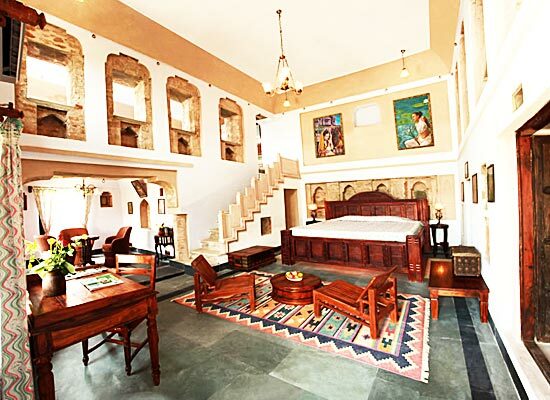 All the 18 rooms in the hotel are designed very traditionally to portray the real colors of Rajasthan. The rooms are named, after the nearby forests, as Dandhkarnya, Sundervan, Mahavan, Kadambvan, Kalanjar, Madhuvan, Chitrakoot, Nandavan, Rishayamoonk, Himgiri, Kadlivan, Dronanchal, Mainak, Kokilavan, Malya, Pampapur Parn Kutir, and Paarijaat. The rooms are designed and furnished very sophisticatedly so that one could feel the rich heritage of India blending in with the modernity of the country. With luxurious amenities in every room, a stay in any one of them is truly memorable. The dining experience is pure delight at the hotel’s on-site multi-cuisine restaurant Akshyabatloi which specializes in Indian, continental and Rajasthani delicacies that are served in buffet style. The guests enjoy the exotic picturesque sights of the majestic Aravalli hills from this rooftop restaurant. Along with the folk music and folk dance performances in the evening in here, the views come more alive than ever and so does the delicious food. The city of Alwar in Rajasthan has become one of the hot spot destinations for tourists. The princely state of Alwar was established by Rajput King of Kachhawa lineage, Pratap Singh in the year 1770. With numerous majestic monuments, serene lakes, gorgeous valleys, it has made a special place in the hearts of tourists. The most famous attractions in Alwar include Sariska Tiger Reserve and the haunted place Banghar Fort.